The proposal would allow an individual convicted of their third DUI with a BAC of .16 or higher to be found guilty of a felony offense. The same penalty would apply to all individuals convicted of four or more DUI offenses. This approach would provide a stronger deterrent to drunk driving and help keep the most dangerous and irresponsible offenders behind bars. The House of Representatives passed legislation recently that would require able-bodied Medicaid recipients to work at least 20 hours a week or take steps toward finding long-term employment by searching for a job or participating in job training programs. The bill was sent to the Senate, where I hope it will receive prompt and thoughtful consideration. Work requirements are designed to help Medicaid recipients transition to new and better employment opportunities to achieve self-sufficiency. The new conditions would mirror requirements that are already in place for the Supplemental Nutrition Assistance Program (SNAP). The requirements would not apply to Medicaid recipients who have a disability, pregnant women or caregivers to children under the age of 6. It would only apply to able-bodied adults. Medicaid is one of the largest expenses in the state budget, and the costs for this program will only continue to climb in the future. It is critical for lawmakers to explore every avenue to reduce long-term costs in the program and help more families achieve financial independence. 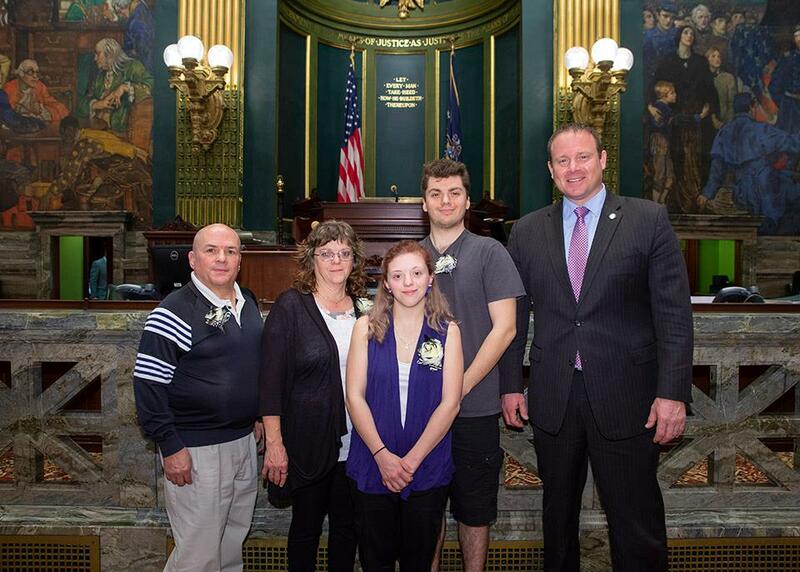 The life and work of Davina Shober was honored in the Capitol recently with a resolution recognizing May 2018 as Ehlers-Danlos Syndrome (EDS) Awareness Month in Pennsylvania. I was honored to welcome and recognize members of Davina’s family on the Senate Floor. Improving the diagnosis and treatment of pediatric cancer is one of the best ways to help young people who are affected by this devastating disease. The Senate recently passed a bill that I sponsored to help generate additional money to support pediatric cancer research. Senate Bill 1091 would allow Pennsylvanians to voluntarily donate $5 to the Pediatric Cancer Research Fund when electronically renewing a driver’s license, photo identification card or vehicle registration. The funding would be used exclusively for pediatric cancer research. More information about my bill is available here. The invasive spotted lanternfly can cause considerable damage to fruit and hardwood trees and create significant challenges for Pennsylvania’s agriculture community. Lancaster County remains in the quarantine zone to slow the spread of this dangerous pest. Community residents are encouraged to take certain precautions to avoid spreading the spotted lanternfly to other parts of the state. Motorists should avoid parking cars under trees since the spotted lanternfly may lay eggs on the underside of vehicles. Any living spotted lanternflies or egg masses that are discovered should be destroyed. Brush and yard waste should not be moved out of the quarantine area until the quarantine is lifted. More information on ways that community residents can help prevent the spread of this invasive species in available here. Congratulations to Lauren Elledge for being named Pennsylvania’s 2018 Distinguished Young Woman. 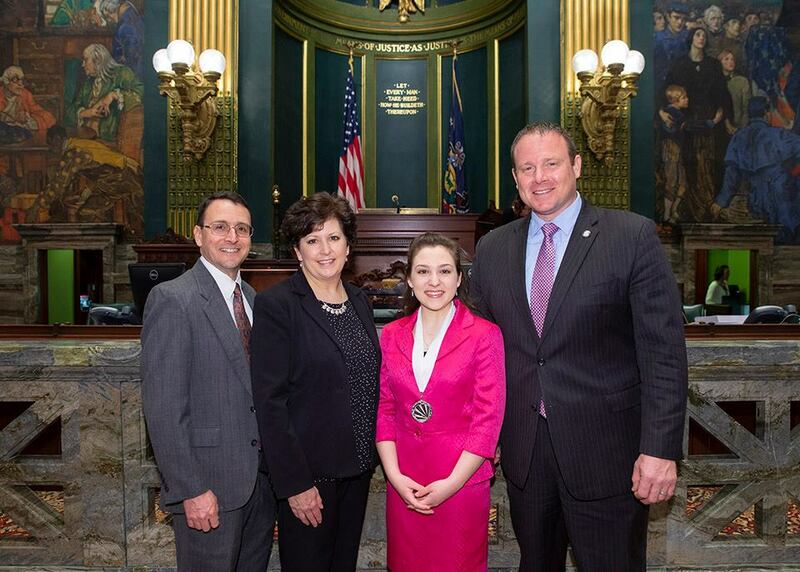 It was a pleasure to welcome Ms. Elledge and her parents to the Pennsylvania Senate. Archaic property tax collection rules have created serious problems for some Lancaster County school districts and municipalities, and many of these problems arise due to the individuals who are elected to serve as tax collectors. I recently introduced legislation that would reform this process and help local governments use the most efficient and effective means of collecting taxes. My bill would give counties and municipalities more flexibility to have the County Treasurer administrate property tax collection and would permit school districts to collect their own property taxes without having to enter into any special costly agreements. This arrangement would allow local governments to avoid a duplication of services and help protect taxpayers against the consequences of the improper collection of taxes.